We all know how older children love projects. They like to think they are "big kids", capable of more complex activities. Read on for two crafts created just for them. During this time of the year, Christmas is on everyone's mind. Here is yet another way to explore Santa Claus, gifts, and Christmas trees. 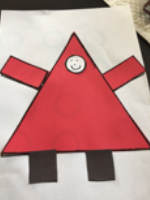 Draw one large triangle and two rectangles on the red construction paper to represent a body and arms (see pictures). 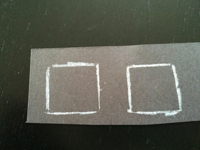 Draw two squares on the black construction paper. They will become boots (see picture). 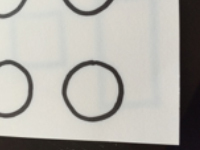 Trace a circle on the white paper (see picture). This circle will become your Santa's face. On the piece of white paper, draw a Santa model (see picture). Adapt the dimensions to suit your needs. Provide all the necessary pieces (body, arms, boots, face, model). Have children cut out the Santa Claus parts and glue them on the model. 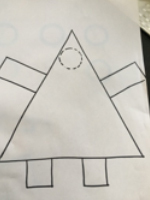 Invite them to draw eyes, a nose, and a mouth on the white circle to complete their project. 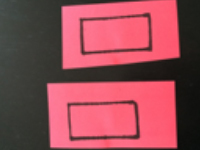 Select several different colors of construction paper and trace many circles on each one. 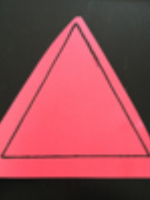 Have children cut them out. 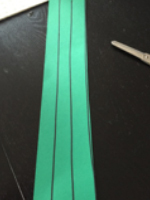 Draw several lines on green construction paper and have children cut along the lines. 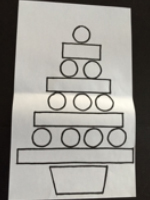 On a piece of white construction paper, draw a Christmas tree model as shown in the picture. 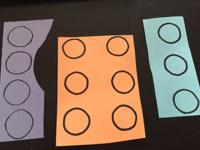 Modify it if you wish, but keep in mind that the goal of this activity is to provide children with the opportunity to cut circles, cut paper into strips, and reproduce a model. 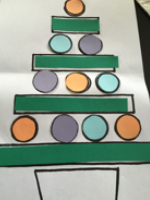 Once the circles and the strips of paper are cut out, invite children to assemble the tree as per the model.